Once again, cultural tensions at UCSD are in the news. Two weeks ago UCSD Associated Students Campuswide Senator Ashton Shahyad Cohen was photographed at a costume party wearing traditional Middle Eastern garb. The image was later posted to Cohen’s private Facebook profile with a caption alluding to the women posing alongside him as his “three wives”; the caption was apparently written by one of the women pictured. After being emailed the image by a friend, fellow UCSD student Noor El-Annan disseminated the photo of Cohen on Facebook, later describing it as offensive and culturally insensitive. 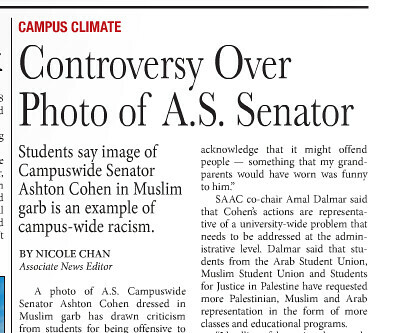 On April 26th UCSD student newspaper the Guardian published a front page story “Controversy Over Photo of A.S. Senator”, with the subheading “Students say image of Campuswide Senator Ashton Cohen in Muslim garb is an example of campus-wide racism.” In the Guardian piece El-Annan was quoted as “offended and disgusted” by Cohen’s decision to wear the outfit to the costume party. Cohen denied that his actions represented an anti-Muslim bias, complaining that “rather than debating the issue, [offended students] threw out the racist card.” Cohen also noted that two of the three women pictured alongside him are Muslim. Notably, the Guardian title phrase “Muslim garb” is an inaccurate description of Cohen’s outfit, and mistakenly conflates the comprehensive term “Muslim” with the Middle East. Front page of the 'Guardian', 26 April. Two days later political blogger Bruce Kesler commented on the story under the vitriolic title “Palestinian Clown Union at UCSD”; Kesler termed El-Annan “a pro-Palestinian fanatic”, and asked if she and other offended students would have “preferred photos of clitorectomies, which is also a common Moslem practice?” BuzzFeed then picked up the story, publishing “A Joke About ‘Three Wives’ Re-Ignites Jewish, Muslim Tensions At California College” on May 2nd. In addition to covering the current controversy BuzzFeed summarized UCSD’s ongoing problems with campus climate, recounting the debate over the “divestment” movement at UCSD, which has unsuccessfully attempted to bar the university from investing in corporations that profit from arms sales to Israel. El-Annan is a member UCSD student organization Students for Justice in Palestine, which supports divestment; in his role as A.S. Senator Cohen has opposed it. BuzzFeed also discusses the April 2011 “Open Letter”, a paid ad placed in the Guardian by 28 faculty authors that described pro-Palestinian student groups as “driven less by positive impulses of fraternity toward fellow Arabs and Muslims than by hateful impulses to destroy the world’s only sovereign Jewish nation.”* BuzzFeed additionally referenced a faculty response to the 2011 open letter, “An Open Appeal to Chancellor Fox and the UCSD Community”, published here April 18th, 2011. A week later in the Thursday, May 3rd issue the Guardian retracted the story, with Editor-in-Chief Angela Chen authoring a thousand word statement explaining the reasons behind the decision. Chen termed the story “a failure of reporting,” and wrote that the Guardian incorrectly assumed that “El-Annan was speaking on behalf of the political movement of divestment when she was speaking, more specifically, about an [sic] cultural issue.” The original story was removed from the Guardian’s website, and is only viewable online through a PDF of the entire April 26th edition (Chen’s statement misidentifies the publication date of the original story). Taylor Marvin: In recent years the Guardian has run numerous stories relating to the Israeli-Palestinian issue on campus; specifically, the ongoing divestment debate and the 2011 faculty open letter. What are the Guardian’s goals when covering these issues? Angela Chen: As the official student newspaper the Guardian above all strives to be relevant to what’s happening to students on campus. Our goals in covering [the on-campus Israel-Palestine debate] are to bring up an issue that’s hugely important to a majority of campus, both those who are pro-divestment and anti-divestment. This issue reoccurs each year, is tied to a national and global political issue, and is something that’s happening on campus. In the Guardian’s opinion section we usually run two guest commentaries, giving each side a platform to express their opinions. We are the campus paper, and I think that it would be a huge act of negligence on our part if we weren’t to cover it. It is a difficult issue to cover, but is important, emotional, and has large implications. TM: When covering these issues has the Guardian’s editorial staff ever come under external pressure, either from student groups or the UCSD administration? AC: I have personally covered this issue for quite a while — in 2010 and this year — and we have not come under pressure from the UCSD administration; no one has said ‘you can’t publish this’, or anything like that. I don’t think there’s any direct censorship on the administration side. On the student side, when we make mistakes — and we do make mistakes, whether in terms of mistaken terminology or bias, and we try our best to correct them — students will contact us, but it’s never anything as explicit as ‘don’t you dare record this’ or telling us how we should do our reporting, or how to write our editorials. TM: What type of influence or contacts do you receive from student organizations? AC: People will contact me complaining that a story misrepresented an issue. It is rare that [students] will say that they were misquoted, and never that we made up a quote. It’s more often an issue of how [the Guardian] presented information, or how an article was structured — sometimes writers or editors aren’t careful enough in editing. TM: To the best of my knowledge article retractions by the Guardian are rare. Can you describe the process that lead to last week’s decision to retract the April 26th story? AC: Retractions are rare; we’ve run a couple this year. This retraction was more of a personal- if you look at the story you’ll see that it doesn’t say “editorial board”; it is under my name and my position as Editor-in-Chief. The process behind the decision [involved] thinking about the Guardian and the goal of journalism in a holistic way. As I said in the piece, aside from issues of terminology people weren’t misquoted and there were no blatant accuracy issues, but having talked with both sides I think journalists have a duty, especially in issues like this, to give context and be more careful in their writing. In the past I don’t think we’ve necessarily done that. Like I’ve said, our articles are online, and people link to them. People’s names will show up in searches. I think that it is our responsibility to look really closely at this kind of thing. Given that, the article was poorly written, it did take some things out of context, and did not include that Ashton [Cohen] had said he was reaching out [to his critics]; that’s why it was retracted. At the same time people have already asked me if they can get their names removed from divestment-related articles published two years ago. Right now I’m still open to feedback from the general public, but it’s an entirely new can of worms to do things retroactively. I’ve never taken an article offline before besides this one, and if I were to do so again the burden of proof on the person requesting [a retroactive retraction] would be extremely heavy. Now I’m open to hearing more feedback about what we’ve done wrong, and which articles have portrayed people badly in the past. But going way back anyone could say ‘I was portrayed in a bad way’ and we have no way of assessing the claim. TM: Are you specifically talking about removing past articles that former students say portrayed them inaccurately, or just unflattering? AC: Some of the articles in question are just be letters to the editor, and the author will say that, for example, they are now going to law school and don’t want juvenile writing to be associated with their name. We receive a lot of these requests, and in most cases don’t take them down — it is their writing, there’s no libel or slander involved, and this is how they chose to portray themselves. The only articles I would be open to taking down are ones that can be proven to be false. TM: Would you say that your decision to retract the April 26th article was strictly related to the article’s “failure of reporting”, or was it driven by external considerations? AC: The majority of the decision was a due to a failure of reporting. The Guardian as an entity has been under fire from both sides, who have implied that we’re both pro-Israel and anti-Israel. I think that my retraction did consider the Guardian’s [wider] context, simply because we want to continue reporting this issue. If we write articles that even I admit are poorly written or poorly edited then we are not going to be a relevant, trusted source of information. If we retract an article it is because of the reporting, but also because it is the Guardian’s duty to provide articles that are informed, and both sides can agree portrayed them fairly. This article didn’t do that. TM: What steps are the Guardian taking to avoid this type of situation in the future? AC: I am trying to set up a meeting with [student organizations] to address this issue. I think one of the the Guardian’s weaknesses is outreach; we’re focused on what’s happening, but we’re not necessarily out there ourselves. Few of the Guardian’s editors are involved in other student organizations, and the staff can become very insular. I am trying to institutionalize more outreach, like attending campus climate meetings and talking to all student orgs. I am specifically focusing on the news and opinion sections, where sensitive issues are most commonly touched upon. I am personally working with these sections to develop a guide to covering sensitive issues. Obviously I’m not the expert on [these issues], but there are just some things writers are not aware of: terminology, or how to phrase questions to avoid bias. I plan on taking a bigger role on working with my editors and my writers on this. That’s something I hope to institutionalize as well, because a lot of knowledge at the Guardian gets lost when key people leave. If we can guarantee that we will regularly meet with other student orgs, we will check these guidelines, we will fact check more carefully, and it will help the role of the Guardian in the future. 1. In recent years the Guardian has run numerous stories relating to the Israeli-Palestinian issue on campus; specifically, the ongoing divestment debate and the 2011 faculty open letter. What are the Guardian’s goals when covering these issues? 2. When covering these issues has the Guardian’s editorial staff come under external pressure, either from student groups or the UCSD administration? 3. What is the Guardian’s policy for dealing with these pressures? 4. To the best of my knowledge article retractions by the Guardian are rare. Can you describe the process that lead to this decision? What steps is the Guardian taking to ensure that this does not happen again? 5. The Guardian’s retraction statement, authored by you, references “institutionalizing many of its formerly non-existent guidelines”; can you specify how these prospective guidelines will impact coverage of campus climate, if at all? *In April 2011 I published a post critical of the original open letter “An Open Letter To Our University Community About Troubling Hypocrisy On Our Campus” and its faculty authors, titled “UCSD Professors Accuse Student Groups of Hypocrisy, Anti-Semitism.” After hosting the faculty response letter “An Open Appeal to Chancellor Fox and the UCSD Community”, I published two counter-responses by faculty authors of the original Open Letter: “Justice in Palestine Week at UCSD” by Dr. Ron Evans, and “A Response to ‘An Open Appeal to Chancellor Fox and the UCSD Community'” by Dr. David Feifel.